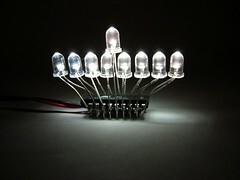 A DIY mini-LED menorah for hanukkah. These are "regular" size, 5 mm diameter LEDs; they take up a lot more room than that tiny chip does. Read more about our LED mini-menorahs here.